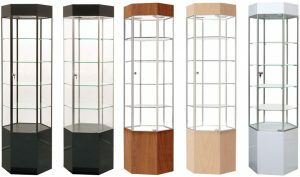 Tower display glass showcases from KC Store Fixtures will be music to your ears as customers first see the merchandise, than ask to feel the merchandise inside, and, ultimately, purchase and take the merchandise home with them. To make things even better, many of our retail display cases are in-stock, and ready-to-ship; they’ll even arrive full-assembled and ready to immediately be put on display in your stores. 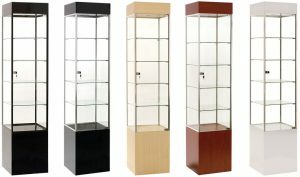 Wall and trophy cases that merchandise your products in an appealing fashion that attracts customers and increases sales. Glass and acrylic display cases for counter tops that draw customers attention and help sell your smaller items – these cases visually attractive, and lockable, to keep valuable items safe and secure. 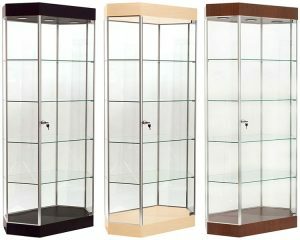 Frameless display cases that combine security with modern elegance to provide an ideal display solution at an affordable price. KC Store Fixtures offers so much more than glass display cabinets. Please spend a little time with our on-line Catalog Division, where you’ll find thousands of standard store fixtures and retail displays; mannequins and display forms; slatwall, gridwall and pegboard; garment racks; retail store shelving; retail nesting tables, bins and pedestals, and much more to enhance the merchandise in your store. For truly custom merchandising possibilities for your store, or brand, please visit the Studio Division website or contact Shelley Gummig at 816.842.8866 to learn more about how we really would like to help make “displays your way” – especially if you don’t see exactly what you’re looking for on our website. *Savings shown is compared to competitors advertising units with similar or lesser features. Price is per unit, based on style. Colors shown are in stock; custom colors available at an additional cost. 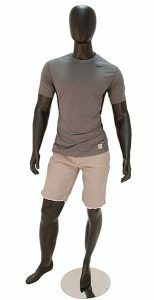 Retail mannequins, including full body mannequins, mannequin torsos, dress and shirt forms, jersey forms, and plastic shell forms are 10% OFF* through May 31, 2018 – just visit kc-store-fixtures.com and when you’re ready to check out, use promo code UNREAL. Jersey forms offer a stylish, classic look that can be used with pins to create a tailored look, and to help hold garments in place. Plastic shell forms provide an economical and versatile solution, and they can be used on a wall or garment rack, or displayed from a hook. Studies show retailers using mannequins generally generate more sales compared to retailers who don’t. They also promote a better all-around shopping experience due to the enhanced store décor. Guide shoppers to items similar to those they’re looking at on the mannequin. Mannequins don’t have to exhaust your budget. KC Store Fixtures offers some truly remarkable and value-oriented mannequins. Most noteworthy are fiberglass forms with realistic faces, and faceless options in male or female physiques. 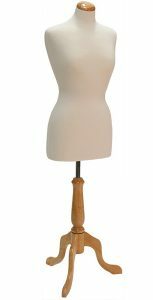 We also stock flexible child mannequins, flexible wire forms, molded plastic leg forms, and injection-molded plastic male, female, and child forms with hanging hooks. Looking for More than Mannequins? Please spend a little time with our on-line Catalog Division, where, in addition to mannequins and body forms, you’ll find thousands of standard fixtures and displays; slatwall, gridwall and pegboard; garment racks; showcases; retail store shelving; retail tables, bins and pedestals, and much more to enhance your store. *Offer discount expires 5/31/18. 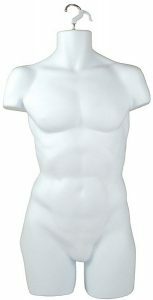 10% discount valid on faceless, headless and flesh-tone mannequins, jersey forms and molded plastic shell forms. Use promo code UNREAL during check out process to receive discount. Other offers or discounts cannot be combined with . Excludes previous purchases, special or custom orders. 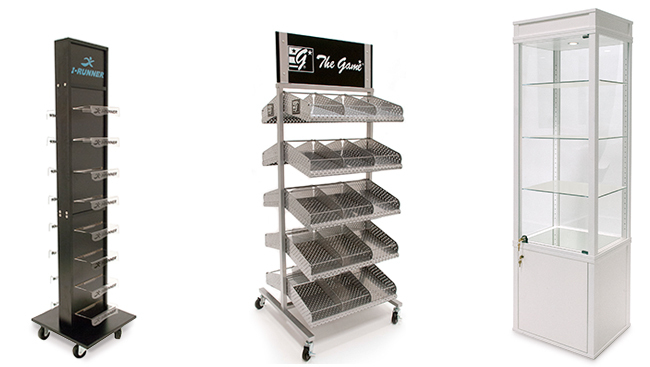 As you can see, these extremely versatile wire grid storage units can be used to organize and merchandise t-shirts and other types of merchandise in a retail setting, or at a craft fair. They can also be used at home to organize playrooms, and closets, and offices; to help sort laundry; to help keep garages tidy; and yes, you can even use these wire grid fixtures as a Guinea Pig cage – just place the storage cubes on their back, with the openings facing upward. If space is a limited, even better, as the small footprint allows a very generous amount of storage space. 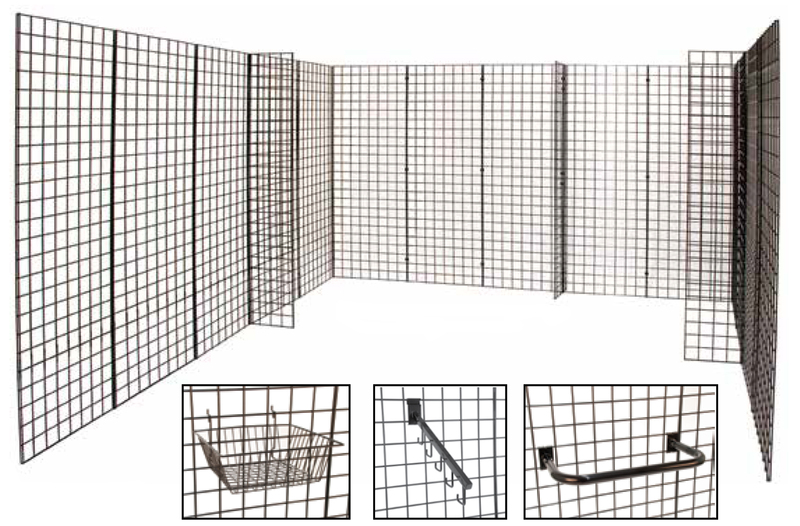 These open-wire, lightweight, super strong (heavy-duty steel wire) mini-grid storage fixtures feature interlocking components that, when assembled, create very functional display cubes. They also come with a rubber coating to help protect contents. And, when empty, they are very portable, making it so easy to move from department to department, and room to room. Mini-grid storage cubes are very easy to assemble. In fact, grid panels and connectors simply snap together, so no tools are even required, though the use of a rubber mallet can help ensure panels are securely in place. It’s very likely that one of our standard storage units will fit your current needs. However, please note that it’s also very easy to reconfigure KC Store Fixtures mini-cube units to meet future needs. So, whether you want a large or small storage unit, along with the ability to change the amount of storage, as needs change, simply know that the components can be easily taken apart and reconfigured. KC Store Fixtures often offers special pricing on select products, including some of our mini grid storage units – please visit https://kc-store-fixtures.com/mini-grid-displays/ to see our complete line, and to learn more about any specials that are available right now. Please also spend a little time with our on-line Catalog Division, where you’ll find thousands of standard fixtures and displays; slatwall, gridwall and pegboard; mannequins and forms; garment racks; showcases; retail store shelving; retail tables, bins and pedestals, and much more. The Studio Division of KC Store Fixtures became new news in 2012. That is when we introduced a new name, logo and brochure for our custom store fixture and custom POP display manufacturing capabilities. With the recent launch of kcstudiodivision.com that old news from 2012 becomes new news again. We once more have the opportunity to alert our existing and prospective customers to the many different turnkey design, domestic and international manufacturing, and fulfillment services, we offer. The new web site also features a portfolio that prospective and existing customers can use to view many examples of completed projects by material, industry, and product type. Unlike most custom retail display manufacturers, we at Studio Division welcome small orders (no minimums), along with complete rollout requests requiring 1,000+ retail fixtures and/or custom POP’s. Customers routinely invite us to value engineer and manufacture boutique fixtures and store displays that they’ve imagined. But even more common are requests for our in-house design team to help them tweak standard store fixtures and POP displays to meet their own brand standards. These projects are often for custom display cases, nesting tables, stacking baskets and dump bins, and associated retail signage. Sometimes they’re made from a single material, but often they’re made from a combination of wood, metal, MDF, glass and/or plastic. You’ll find the Studio Division Team at the KC Store Fixtures booth, where we hope you’ll also ask about the thousands of products we offer through our on-line Catalog Division – standard fixtures and displays, slatwall, gridwall and pegboard, mannequins and forms, garment racks, showcases, retail store shelving, retail tables, bins and pedestals, and much more, most of which can also be customized to meet your specific brand standards. Shoe shopping can be a fun day with friends. For some it’s a nerve-fraying visit with a toddler. In either scenario consumers want an inviting and comfortable in-store experience. A combination of visual merchandising, ample space and comfortable seating play an important role. Nothing takes the fun out of shoe shopping more than lack of seating. Try on a pair of shoes while leaning against a wall. Or worse, balancing on one foot like a flamingo. Customers don’t want to feel like their comfort is an after thought. Include sturdy seating and easy access to mirrors. Space seating no more than 10 feet apart. This gives customers plenty of room to sit, try on and walk around without venturing too far from their belongings. 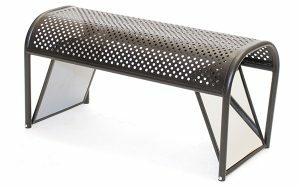 Modern and sleek, this perforated metal shoe bench features a hammertone black finish. Tilted mirrors flank each end for convenience. Measuring 36″w x 16″d x 18″h, it provides easy accessibility while taking up very little space. 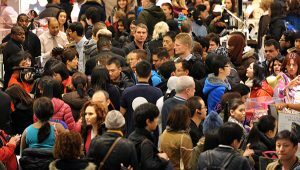 Prepare for Christmas shoppers by de-cluttering your store. Too much choice overwhelms a customer’s mind and it shuts down. If you’re trying to improve conversion rates – and who isn’t, much like a writer, you need to edit. Start with the easy things. Plan for a fall sale so you can move out these customer distractions. It’s great to have a must-have toy, accessory or tool – until you sell all but the last one. Before re-ordering, critically look and see if the market has moved on. Then slash the price of the last one – even if you sold a ton of them at full price. Sitting on complete lines that you ordered in the wrong color? Competitor blew them out at a low price? Who cares? Now’s the time to make them sound like gold and strike their price. If you have to, clean up the boxes, polish the chrome or do whatever it takes to make them look new again. Put up a sign that says, Special Purchase 60% off and move them out. don’t fill it up again with more stuff! Give your edited collection of merchandise more space for customers to move in and around items so they stand out. Use smaller round tables nested around each other to create dramatic display areas for high-profit items throughout your store. Put baskets where customers can see them. Don’t put them in the Transition Zone -otherwise known the store entrance. Customers won’t really “see” them in this area of the store and are more likely to breeze by without stopping. Place the baskets a little further inside to help increase sales. Scatter them throughout the store. Customers may enter your retail store with one purchase in mind but be subsequently be lured into buying more things, either out of impulse or because they suddenly remember they need an extra this or that. 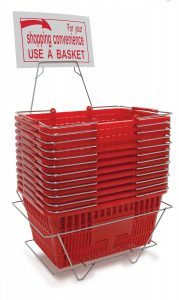 Remember also to keep your stacks of baskets high enough so as not to inconvenience your customers – nobody likes stooping when they have their hands full. Offer a basket to customers carrying more than 3 items. The likely response is a smile from your customer (people like being helped) and a grateful acceptance of the shopping basket. After all, holding a basket is preferable to being hampered with no hands left to touch and read other items in the store. Customers can order a set of 12 including chrome frame stand and sign. Each basket features metal handles that fold down allowing them to stack neatly and easily when not in use. Most of us have a finite amount of square footage we can use. But we’re always looking for more room. If you’re looking for more merchandising space, think vertical. These folding towers are the perfect solution. Choose a black or chrome finished metal frame. 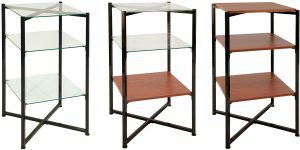 Each tower includes 3/16″ tempered glass shelves and shelf rests. Just as important, the towers can be stored quickly and easily when additional merchandising isn’t the focus. Because towers are available in three heights, you can mix and match them to fit your space. The 68″ tower includes five glass shelves. Our 52″ unit ships with four glass shelves. And the 37″ tower comes with three glass shelves. All towers are 18″ wide by 18″ deep. Shelves can be adjusted in 1-inch increments and additional shelves can be added if more merchandising space is needed. Looking for something more unique? Use wood shelves in addition to, or instead of glass. Combine wood and glass shelves for a unique design. Wood shelves are available in white, black, maple and cherry. If you have something different in mind, we can give you a quote for a custom shelf or tower. All too often customers take the less expensive route and manufacture in-store P-O-P displays with low-cost materials like cardboard, which can be easily damaged. Despite the sticker shock that can accompany high-quality displays, remember that you get what you pay for. A cardboard sign may be easy on the budget, but the ROI quickly diminishes if it only lasts for half the intended lifecycle. Whereas displays made with higher quality, durable materials can withstand transportation, setup, cleaning and frequent in-store contact. P-O-P displays are no exception. When shoppers see well-designed P-O-P displays, they make a mental connection between the quality of the display and the associated product. In turn, cheaply made displays can have an adverse effect on consumers’ opinion of the product or brand. If you’re trying to improve quality perception, semi-permanent P-O-P displays may be the solution. Longer-lasting in-store fixtures are designed to be easily cleaned and restocked. They always look new and reduce the need for frequent repairs and replacements, resulting in greater success and higher ROI. KC Store Fixtures offers quality custom design and fabrication of P-O-P displays and showcases. A wide range of materials from wood and glass to plastic and metal are available. With over 40 years of combined experience, our design team has can create a solution for any budget. Are you looking for the Superhero of displays? When it comes to trade shows, art exhibit displays or other “knock-down” type booths, grid panels are the answer. Heavy duty wire panels are easy to set up and their modular design gives limitless creative options when designing a layout. The added bonus is that these superheroes lie flat during transportation and require less space to store when not in use. But just like any superhero, there is always the understated, less glamorized sidekick that makes the superhero look good. For give this dynamic duo it’s superpower, you need the all important grid connectors. A hidden strength when setting up your grid display. Attached along the vertical edges, grid connectors provide a sturdy, rigid connection between panels while allowing flexibility to create your own configuration. 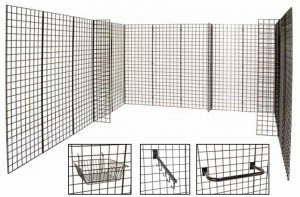 Grid panels are available in a variety of sizes and three colors. If you want a custom solution but don’t know where to start, give us a call. Our knowledgeable and friendly sales associates can help you .